That sentiment was widely shared that night in Oradell, at the state’s only wildlife art museum. Art and animal lovers gathered on May 19 at the Hiram Blauvelt Museum to celebrate “Rare Wildlife Revealed: The James Fiorentino Traveling Art Exhibit.” The exhibit came to life in the gorgeous galleries of the museum, which was formerly a carriage house, accompanied by soothing harp music. The free reception opened with remarks by Governor Kean, who shared the reverence felt by many in attendance. A longtime champion of Fiorentino, he also wrote the foreword to the exhibition’s hardcover book. After a riveting speech, the excitement was palpable. David Wheeler, Executive Director of Conserve Wildlife Foundation, spoke next. After two generous introductions, James Fiorentino finally took center stage. As the youngest artist ever featured in the National Baseball Hall of Fame, he was gracious with his words. Amidst a backdrop that would awe even the most seasoned art collector, it was impossible not to feel inspired. Established in 1957, the Hiram Blauvelt Museum boasts a world-famous collection of wildlife paintings, sculptures and big game trophies. Along with the 25 watercolors of Rare Wildlife Revealed: The James Fiorentino Traveling Art Exhibition, an artistic atmosphere driven by conservation is sure to inspire you as well. Pay a visit while you have a chance! Rare Wildlife Revealed will be shown at Hiram Blauvelt Museum through July 30, 2017. Sales of the exhibition book, original paintings, limited edition digital prints, and wildlife merchandise will benefit Conserve Wildlife Foundation. To learn more about hosting a future showing of Rare Wildlife Revealed – whether for an extended exhibition or a single night’s event – please contact Liz Silvernail, CWF Director of Development at 609.292.3707. Conserve Wildlife Foundation’s “Rare Wildlife Revealed: The James Fiorentino Traveling Art Exhibition” can be found at the famed Hiram Blauvelt Museum in Oradell with a free reception this Friday night, May 19 from 6 to 8 PM. Former Governor Tom Kean will join nationally renowned artist James Fiorentino and CWF Executive Director David Wheeler for brief remarks, and guests will also be served refreshments. The Hiram Blavelt Museum was established in 1957 as a natural history museum to garner support for wildlife conservation. Today, it is one of only five museums in the United States to exclusively display wildlife art. The museum is located at 705 Kinderkamack Road, Oradell, NJ 07649. This innovative three-year exhibition is spotlighted in a nine-minute video by videographer Ed English focusing on a previous stay at the Studio 7 Fine Art Gallery in Bernardsville. The exhibition has also been featured at D&R Greenway in Princeton, the Mayo Performing Art Center in Morristown, the Flying Fish Brewing Company in Somerdale, the Salmagundi Art Museum in New York City, and the Princeton Environmental Film Festival in Princeton. Nationally celebrated artist James Fiorentino has been celebrated for his iconic paintings of New York sports icons like Derek Jeter, Yogi Berra, and Odell Beckham, Jr. Now Mr. Fiorentino returns to New York City with a new muse for his prodigious talents – the vulnerable, oft-overlooked wildlife of the metropolitan area. “Rare Wildlife Revealed: The James Fiorentino Traveling Art Exhibition” will make its New York City debut at the historic Salmagundi Club during the week of April 2-8, 2017. A free reception will be held on Tuesday, April 4 from 6-8 PM at the Salmagundi Art Club Patrons’ Gallery, located at 47 Fifth Ave, New York, NY 10003. Offered by the nonprofit Conserve Wildlife Foundation, the exhibit is part of a three-year traveling exhibition around the northeastern United States that kicked off this past fall. This weekend the nonprofit Conserve Wildlife Foundation attracted over 200 art and wildlife enthusiasts to the premiere showing of their Rare Wildlife Revealed: The James Fiorentino Traveling Art Exhibition at D&R Greenway Land Trust in Princeton. 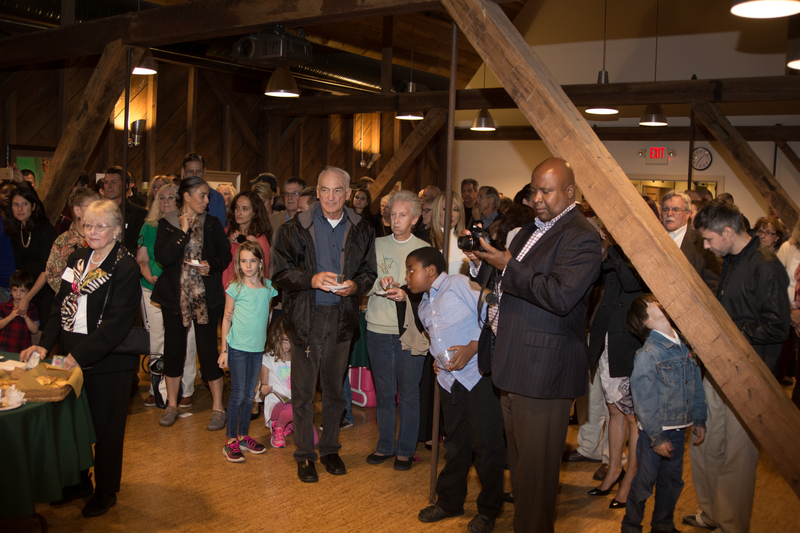 More than 200 supporters, including Governor Tom Kean (and four of our Species on the Edge Art & Essay Contest winners), attended our Opening Reception for the premiere exhibition of Rare Wildlife Revealed: The James Fiorentino Traveling Art Exhibition at D&R Greenway Land Trust on September 30th. Former Gov. Tom Kean headlined the program, along with the nationally recognized artist Mr. Fiorentino, Conserve Wildlife Foundation (CWF) executive director David Wheeler, and D&R Greenway president & CEO Linda Mead. CWF field biologists were also present to discuss their innovative work protecting and restoring the region’s vulnerable wildlife species, many species of which were featured in Mr. Fiorentino’s paintings, as well as a live peregrine falcon, the fastest animal on earth, displayed by Mercer County Wildlife. 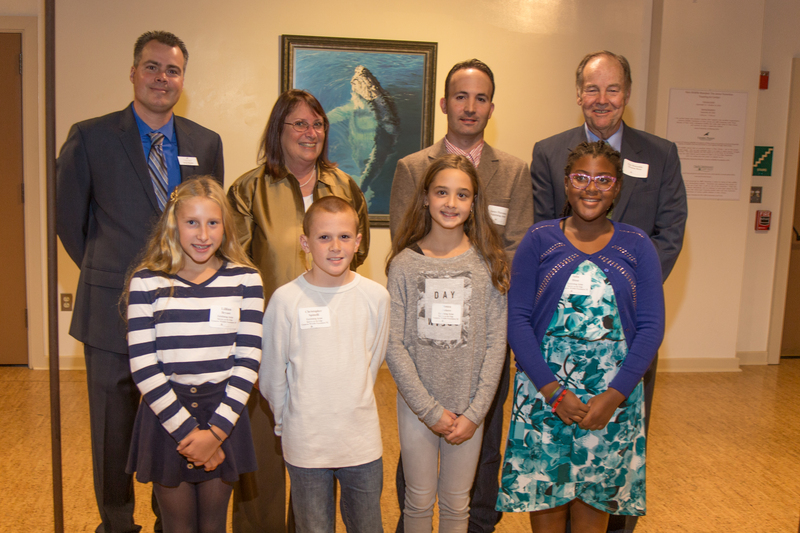 The event also honored several 5th-grade winners of the statewide Species on the Edge Art and Essay Contest, who were congratulated by the former Governor and Mr. Fiorentino before a cheering audience to conclude the program. Crowd gathered at the art opening reception at D&R Greenway. Mr. Fiorentino has painted 25 stunning watercolor images of at-risk wildlife species from New Jersey for this exhibition, from the bobcat and bald eagle to the Pine Barrens tree frog and little brown bat. The exhibition will travel around New Jersey and the Northeast over the next three years. At 15, Mr. Fiorentino became the youngest artist to be featured in the National Baseball Hall of Fame with paintings of baseball legends like Reggie Jackson, Cal Ripken Jr. and Ted Williams; his sports art has since graced national magazines and landed him in interviews with ABC World News Tonight and countless other news studios. Now 39, Fiorentino’s Conserve Wildlife Foundation exhibit is being hosted at D&R Greenway through October 14. 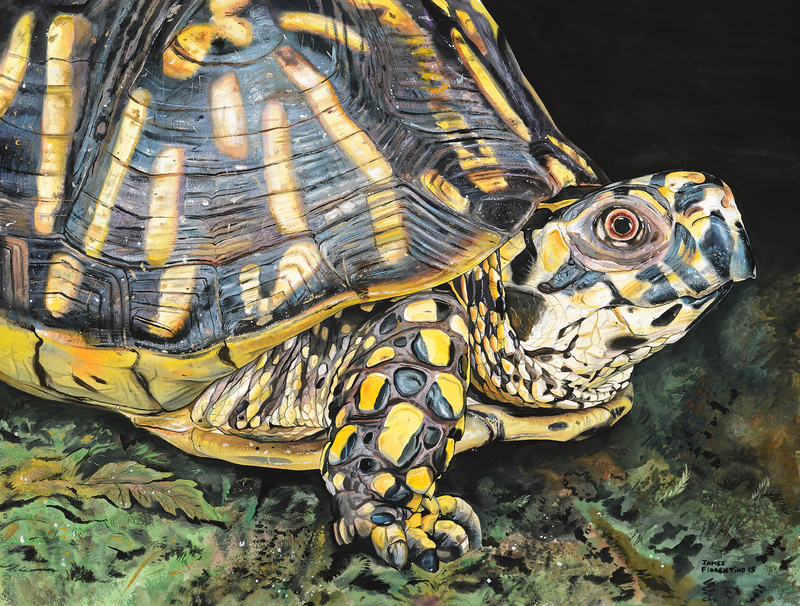 Fiorentino’s realistic paintings depict some of the state’s most endangered and vulnerable species. Among other venues, the exhibition will be shown at Salmagundi Club at 47 Fifth Avenue in New York next spring. Gov. Kean and Wheeler wrote the foreword and introduction, respectively, for the art exhibition hardcover book accompanying the exhibition. Through October, sales of the original paintings, limited edition digital prints, the exhibition book, and wildlife merchandise will benefit Conserve Wildlife Foundation and D&R Greenway Land Trust. Fiorentino started painting animals when he was 10, and he later became a trustee for the Raptor Trust in Millington, N.J.
“We rehabilitate 4,000 wild birds a year and release about half that number,” says Fiorentino. “These wild birds have had a tremendous influence on me. I enjoy getting close to birds of prey, and it brought me back to nature art.” Before going back to his studio to paint the details, Fiorentino sketches the animals up close, sometimes holding them, taking in their details. Eastern Box Turtle by James Fiorentino. Rare Wildlife Revealed: The James Fiorentino Traveling Art Exhibition is sponsored by Omni Distribution, LLC, Flying Fish Brewing Company, Merrill G. & Emita Hastings Foundation, Studio 7 Fine Art Gallery, and Somerset Patriots. Conserve Wildlife Foundation has been a long-time partner with D&R Greenway, exhibiting our Species on the Edge fifth-grade art and essay contest winners annually in D&R Greenway’s Olivia Rainbow Gallery. This year, the fifth graders art will be exhibited simultaneously with the Fiorentino exhibit. For more information on James Fiorentino, please visit www.JamesFiorentino.com. Digital photos from the event are available upon request, as are high-resolution images of the original Fiorentino artwork. Kids are Back in School – but Their Summer Wildlife Lessons Endure! 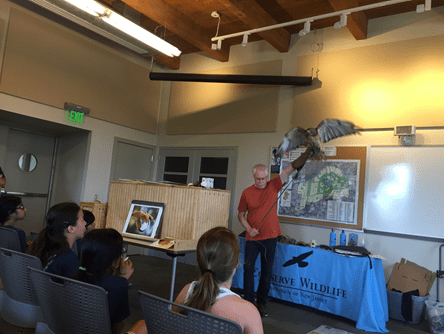 Conserve Wildlife Foundation brought three conservation-themed summer learning experiences to the New Jersey coast. I went back to “camp” this summer, seeing schoolkids learn first-hand about wildlife and what biologists do. CWF offered three summer learning experiences for the first time, each with a different theme, content, and location. Observing the kids’ excitement and enthusiasm for nature was uplifting, and I was also impressed with how knowledgeable they all were. Offering hands-on opportunities – to learn about wildlife while experiencing these habitats – is so important in fostering an appreciation in the younger generations. This summer was a great start, and CWF is excited for the years to come! Seining, special wildlife guests and sandcastles along the Raritan Bayshore! 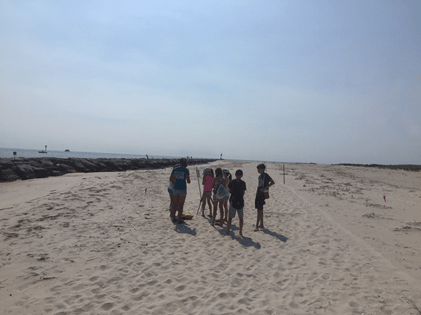 Located in the harbor, across from Sandy Hook, noisy terns and gulls fight over their catches as kids arrive in the morning to spend the part of their day learning about the bayshore environment. Sunny, sand-filled learning about marine and coastal wildlife and habitats, seining for coastal creatures, mini-science activities and special guests were balanced with a healthy dose of wiffleball games and sandcastle-building contests. Kids met biologist and beach nesting bird manager Todd Pover. He talked about – of course – the piping plover, and issues with conserving threatened and endangered beach nesting birds. NJ State Park police officer Karl Mott and K9 Kelly, a police dog who finds lost cellphones, wallets, and even people. Campers were able to see her in action and participate in hiding drills. Raptors, art and orchids on a North Jersey nature oasis! 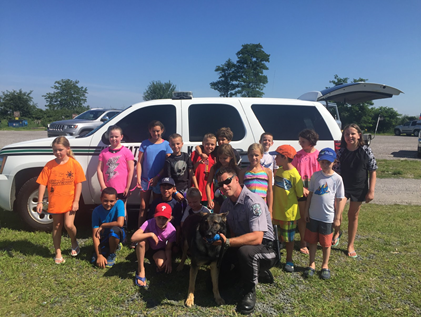 Set in the lovely Duke Farms in Hillsborough, every day of this week-long camp was a new and exciting experience featuring different types of wildlife! Kids spent time exploring the grounds at Duke, played games and explored their creativity through art projects alongside famed artist James Fiorentino, met real life biologists and best of all – got up close and personal with all kinds of raptors (like the red-tailed hawk below), amphibians and reptiles. These memorable experiences will hopefully cement in their minds the importance of being stewards to their environment. 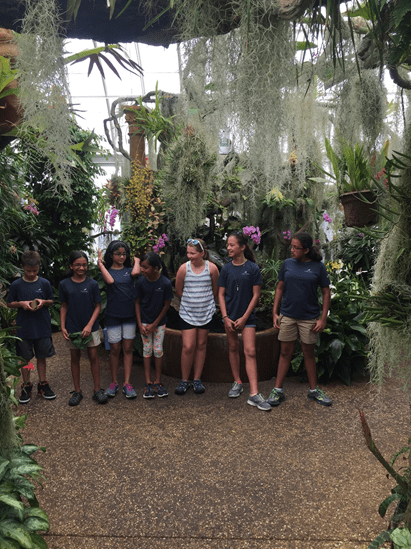 Campers explored the Orchid Range and saw a collection of plants from all over the world. Bill Streeter of Delaware Valley Raptor Center visited to talk about amazing birds of prey, bringing with him their resident educational birds. Campers sat in awe of these raptors like this red-tailed hawk. A day afield with a beach nesting birds biologist! Shorebird biologists know the importance of educating people about the plight of beach nesting birds in New Jersey, who rely on the beaches that people flock to in the summertime. 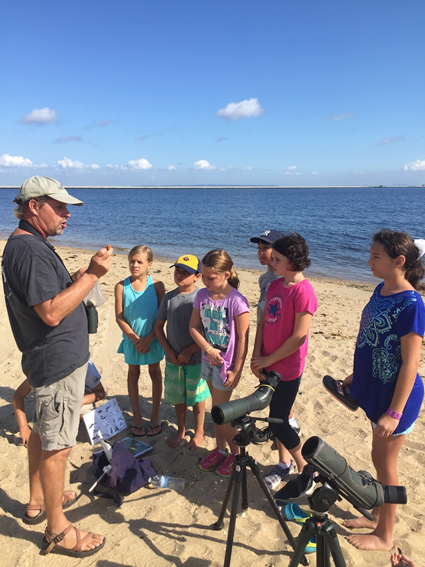 So on three different occasions, parents signed their kids up to spend a day on the beach learning about these birds with CWF biologist, Emily Heiser – like the piping plover, American oystercatcher, black skimmer and least tern. Kids got to practice being wildlife biologists. They used spotting scopes to read tags on decoy birds and searched for camouflaged eggs in the sand. The day was also filled with games, beach scavenger hunts, and a fun poster drawing project to be put on display. Campers spot some plovers and oystercatchers feeding in vernal pools along the inlet at Barnegat Light. 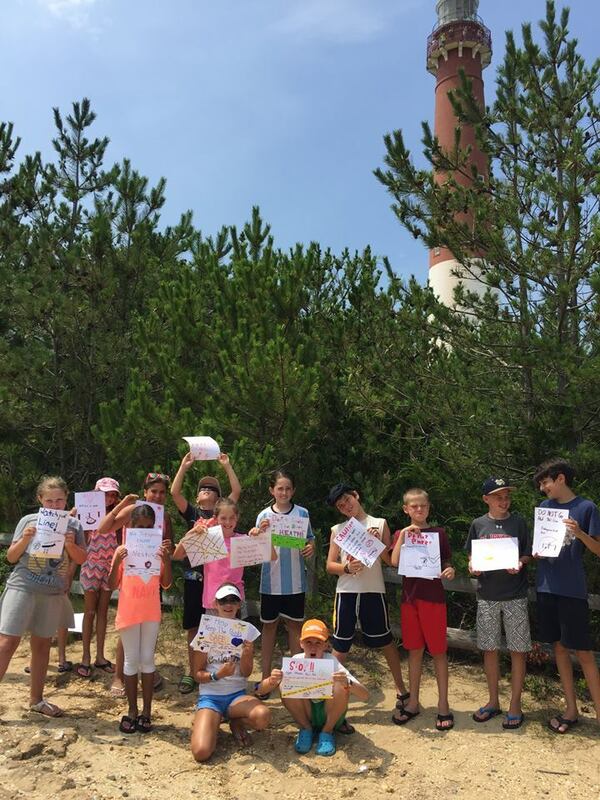 After learning about the plight of beach nesting birds, the kids got creative by drawing signs to be posted near nesting and feeding sites. For more information about these educational programs, please visit our website at www.ConserveWildlifeNJ.org , or contact our Director of Education Stephanie DAlessio at (609) 292-9451. Kendall Miller is a Program Coordinator at Conserve Wildlife Foundation.